Parliamentary Secretary for Transport and Regional Services, Senator Ron Boswell, is hopeful there will be an end to motor vehicle ads that glorify speed in the coming months. 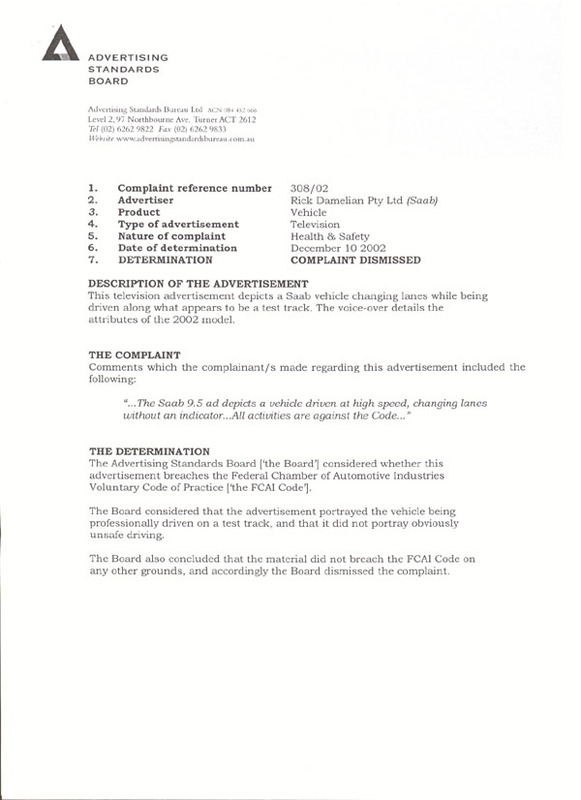 On the eve of a meeting with key stakeholders in the motor vehicle manufacturing and advertising industries, Senator Boswell said it is time the current advertising code was amended once and for all to include specific guidelines for car ads. 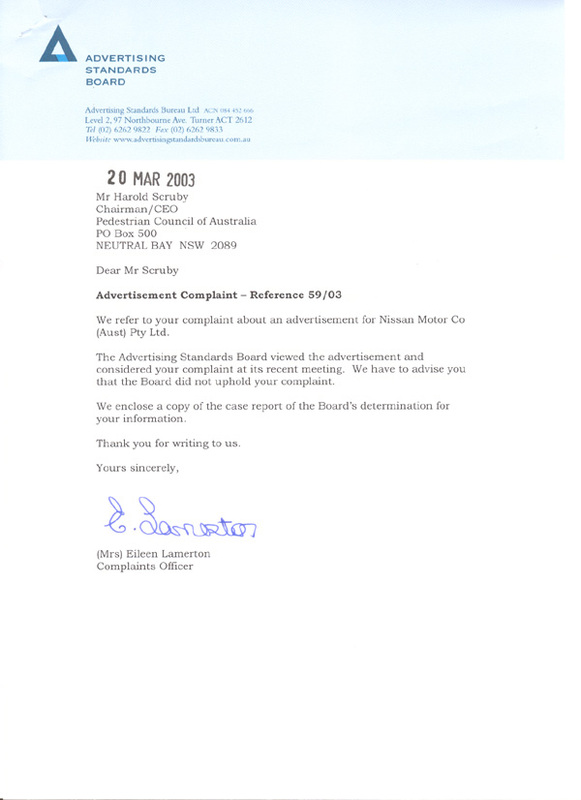 "We simply cannot continue the current trend of car ads using inappropriate driving behaviour to sell their vehicles," Senator Boswell said. "Checks need to be in place to put an end to ads that place an undue emphasis on speed and irresponsible driving behaviour which would be considered illegal on our roads." Senator Boswell said mixed road safety messages were being sent to the community. "On the one hand we have Governments and safety organisations spending millions of dollars to remind the public that speed kills, but on the other hand we have even more money being spent on car ads that promote excessive speed. "Enough is enough. 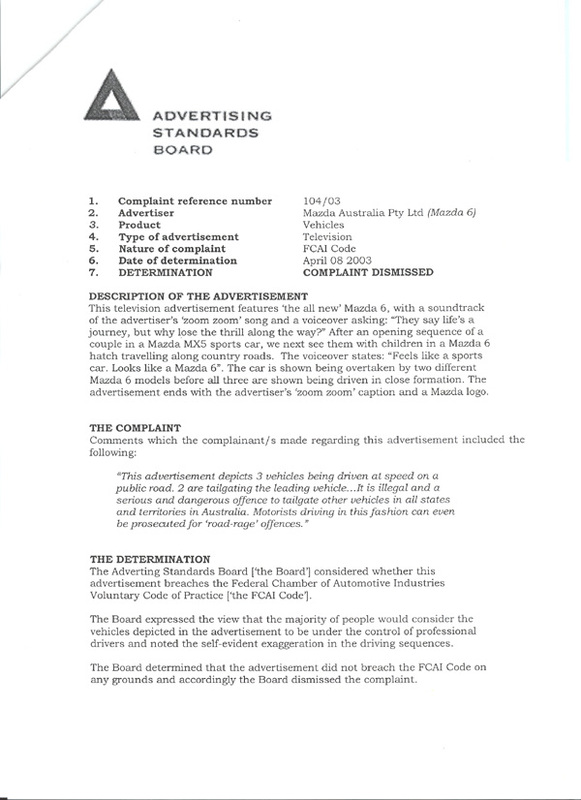 It is time for constructive discussions between the motor vehicle manufacturing and advertising representatives to make the advertising code more relevant to motor vehicle advertising. "We must be united in our message - Speeding on roads does kill. 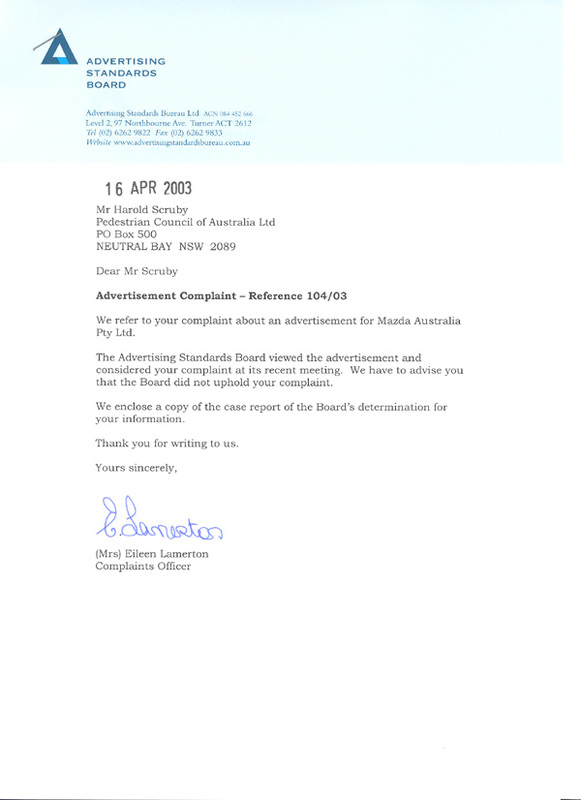 "I ask that the motor vehicle manufacturers and the advertising industry to meet their community obligations and speedily resolve this issue in the interests of all Australians." 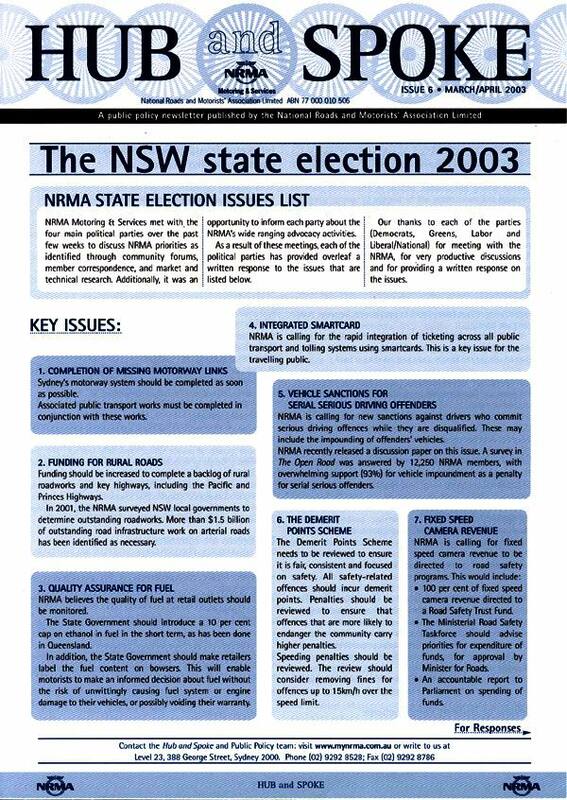 Senator Boswell will convene the meeting in Canberra tomorrow (Wednesday 10 April 2002) from 2pm. Interviews can be arranged by calling Leah on 0407 132 284. Car ads depicting dangerous driving and excessive speed are expected to become a thing of the past after a new motor vehicle industry advertising Code was passed today by Federal, State and Territory Transport Ministers in New Zealand, Federal Transport Parliamentary Secretary Ron Boswell said today. The Ministers passed the Code at a meeting of the Australian Transport Council in Auckland. Senator Boswell said the Code is a major step forward for the industry and ties in with other road safety initiatives that promote safe driving aimed at reducing the road toll. "The link between speed and safety is well established and there has been concern that some ads have been undercutting the road safety advertising of governments. There is also a particular concern about effects on the driving behaviour of young and impressionable motorists," he said. 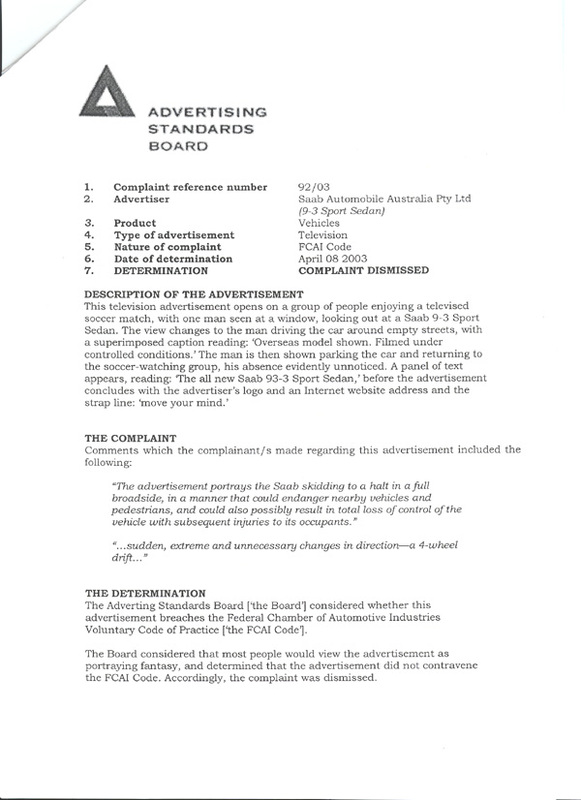 "I commend the Federal Chamber of Automotive Industries (FCAI) for developing its advertising Code in consultation with industry and other relevant stakeholders including Federal, State and Territory governments and road safety organisations. 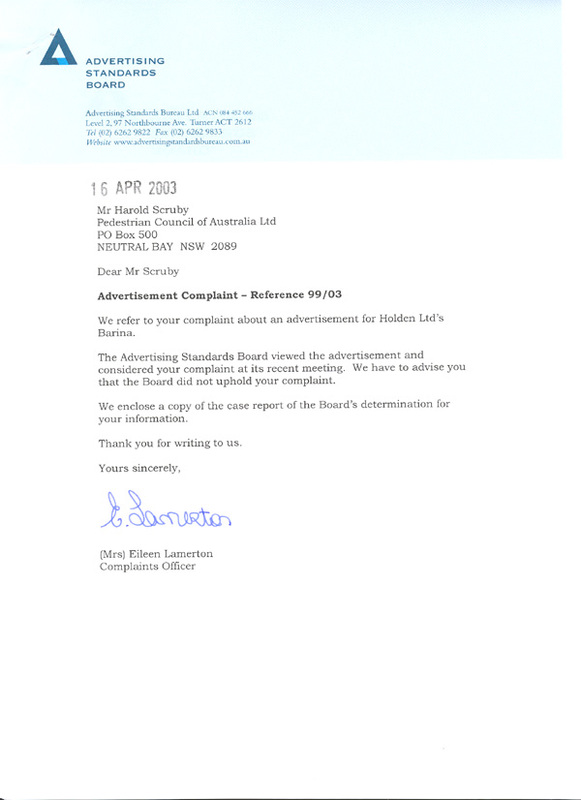 "The Code is a responsible approach to the voluntary regulation of advertising for motor vehicles. Effective implementation of the Code will demonstrate the commitment of motor vehicle manufacturers and the advertising industry to meeting their obligations to the community." - speeds in excess of speed limits. - deliberate and significant environmental damage. 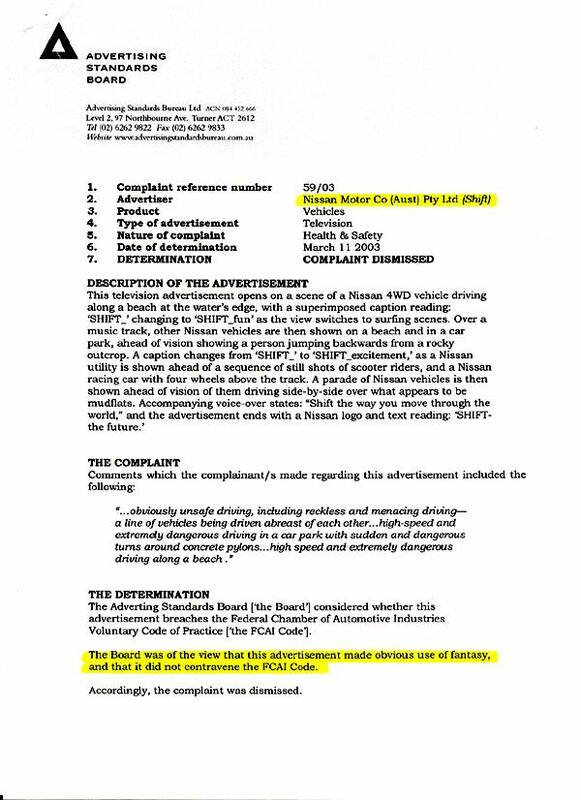 "In the past there has been very little guidance to advertisers about what needs to be observed in the development of advertisements for motor vehicles," Senator Boswell said. 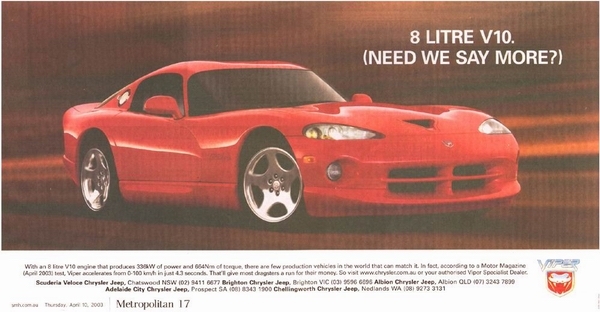 "I'm pleased that there are now specific guidelines for car advertising that should put an end to motor vehicle ads that glorify speed and other irresponsible behaviour." 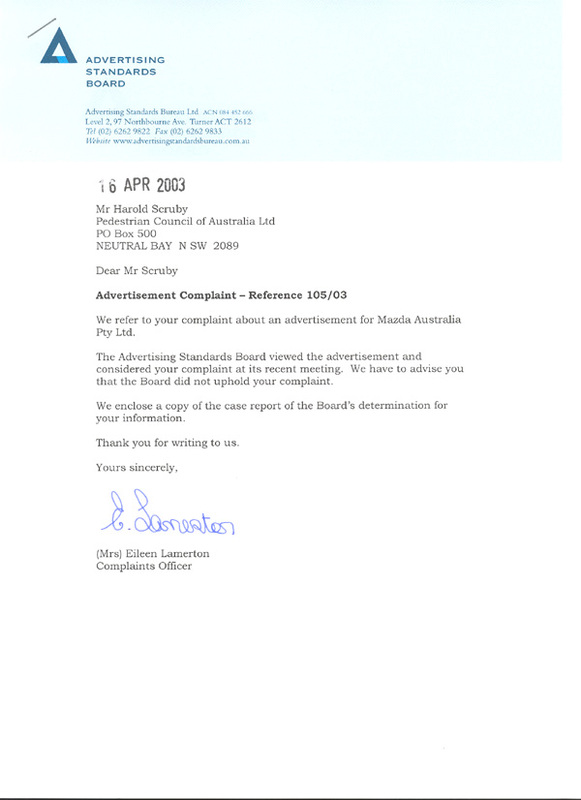 The new Code applies to all new advertisements produced after 8 August 2002 and to all advertisements, regardless of when produced, after 1 December 2002. 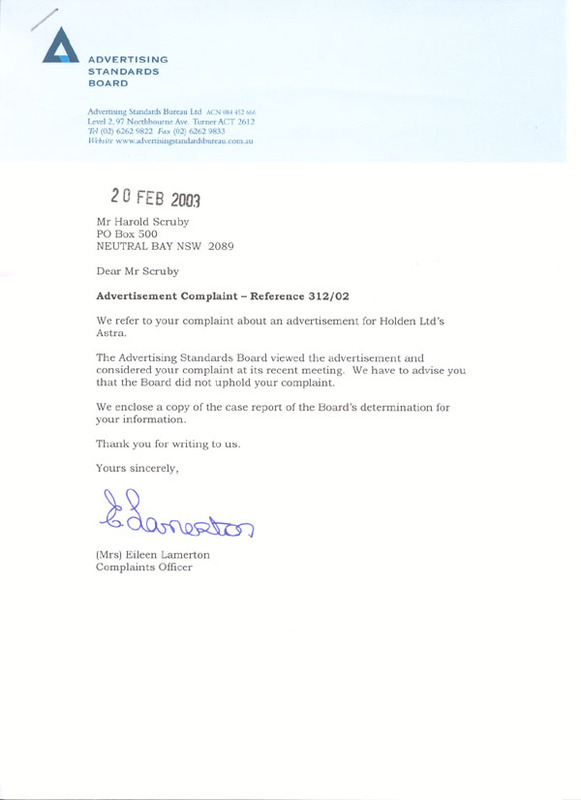 The Advertising Standards Board will administer the Code. Development of the Code has been undertaken by the Federal Chamber of Automotive Industries (FCAI), representing manufacturers and importers of new vehicles marketed in Australia. The Code is intended as a means of advertising self-regulation in Australia and is to be applied to all forms of advertising for motor vehicles. Vehicle occupant protection and road safety are primary concerns for the automotive industry in the design and operation of all motor vehicles supplied to the Australian market. 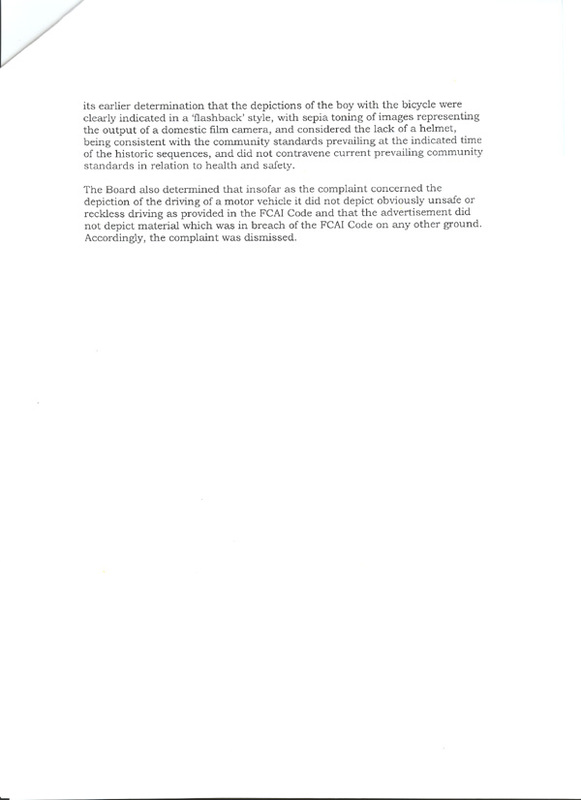 FCAI endorses the National Road Safety Strategy and acknowledges the importance of increased road safety awareness in the Australian community and fully supports the efforts of all relevant Commonwealth, State and Territory authorities to secure this outcome. 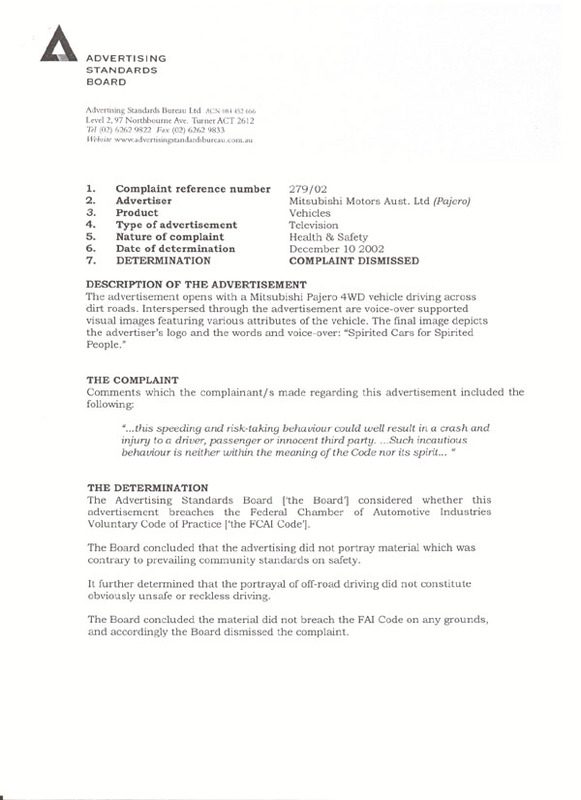 The FCAI supports a responsible approach to advertising for motor vehicles. 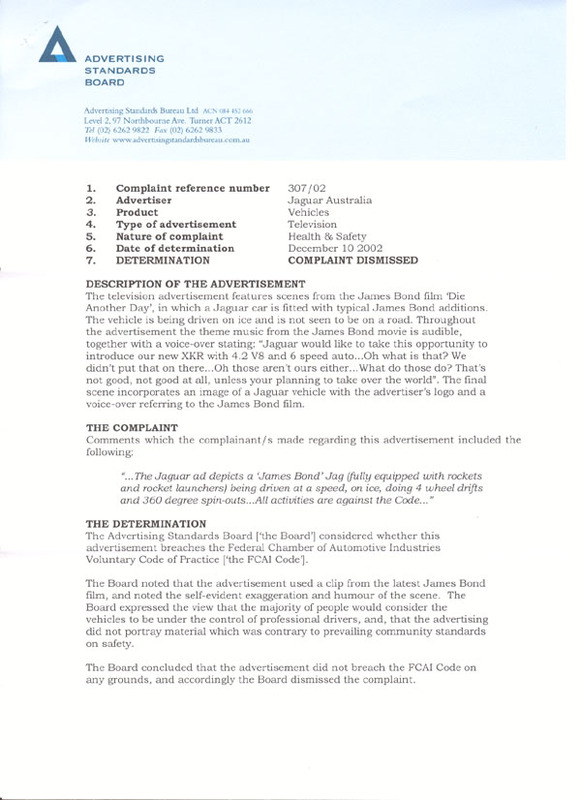 While acknowledging the legitimate use of motor sport, fantasy, humour and self-evident exaggeration in creative ways, the FCAI asks advertisers to be mindful of the importance of road safety and to ensure that advertising for motor vehicles does not contradict or undermine efforts to achieve improved road safety outcomes in Australia. 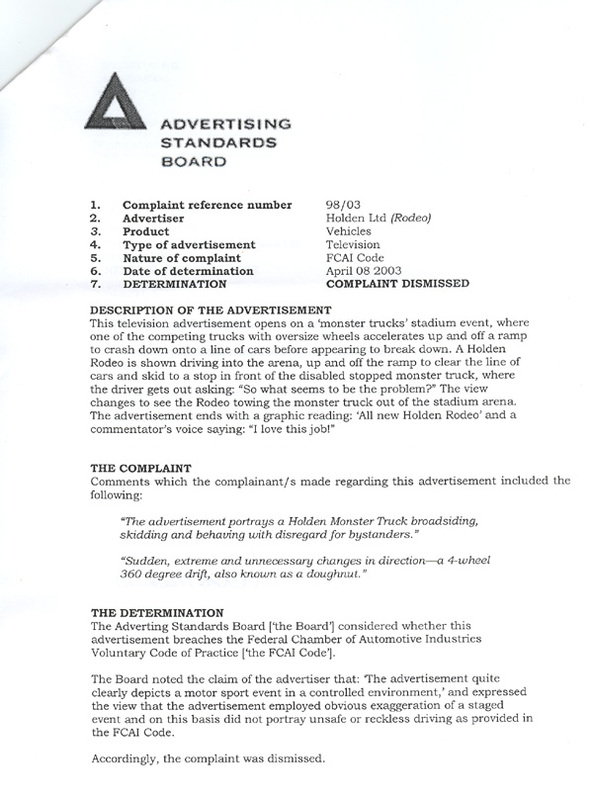 The Code will apply to all new advertisements for motor vehicles produced on or after 8 August 2002. 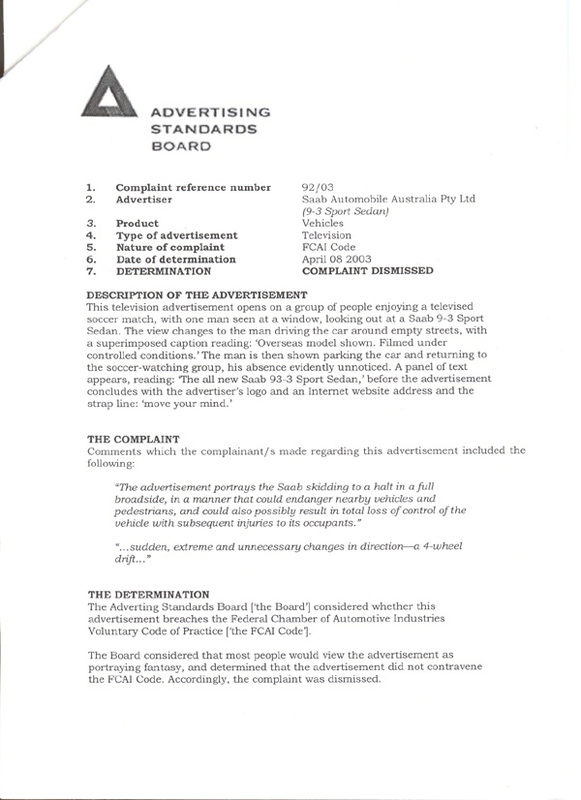 Moreover, regardless of date of production, it is intended that all advertisements for motor vehicles published or broadcast in Australia on or after 1 December 2002 should comply with this Code. 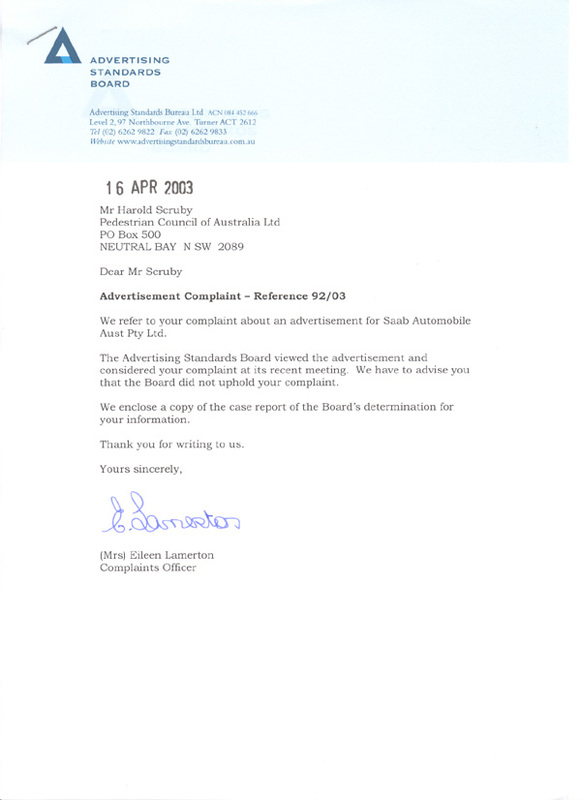 Compliance with the Code should be administered by the Board of the Advertising Standards Bureau Limited (ASB) as part of its review of advertising complaints. 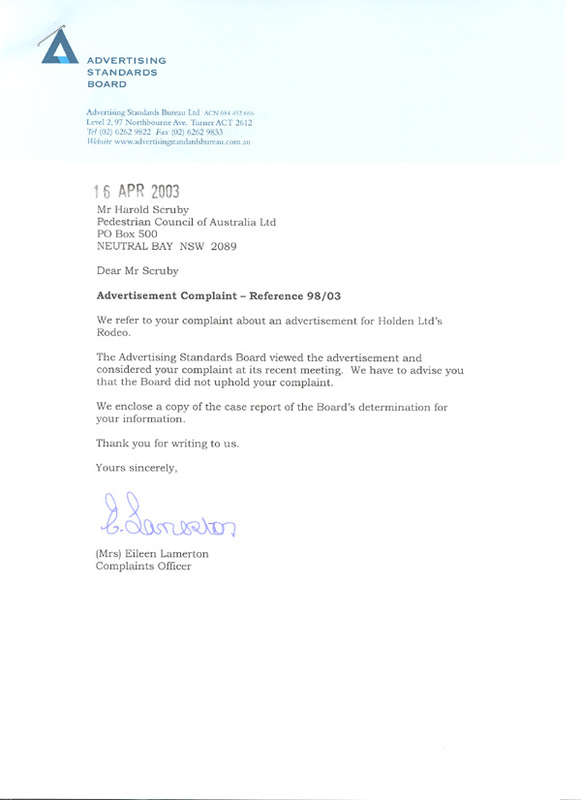 In administering the Code, the ASB is to give relevant advertisers the opportunity to present such evidence as they (i.e. 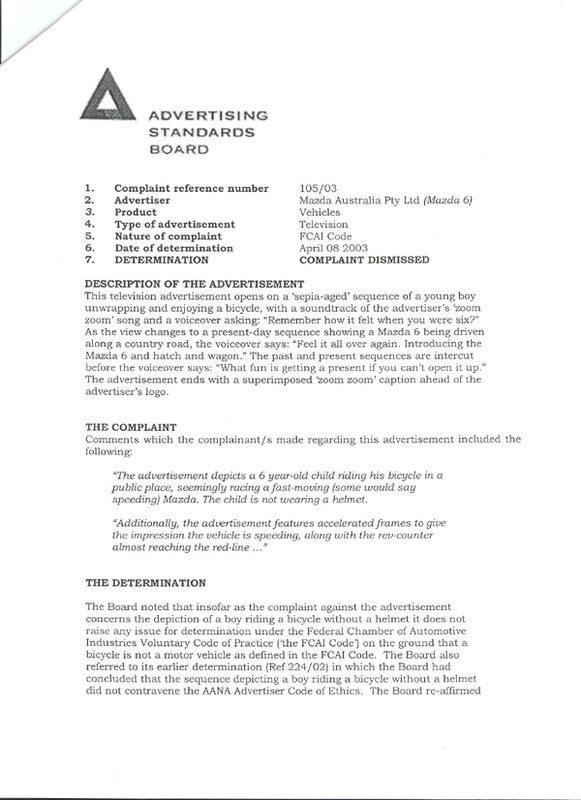 the advertisers) deem appropriate in defence of any advertisement under review, prior to making any determination in relation to its consistency, or otherwise, with the requirements of the Code. 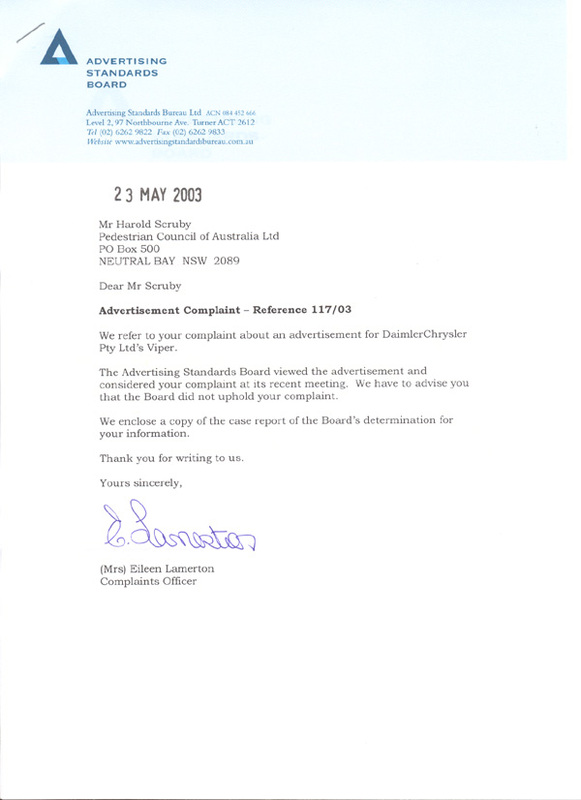 (e) The Advertising Standards Bureau Limited. 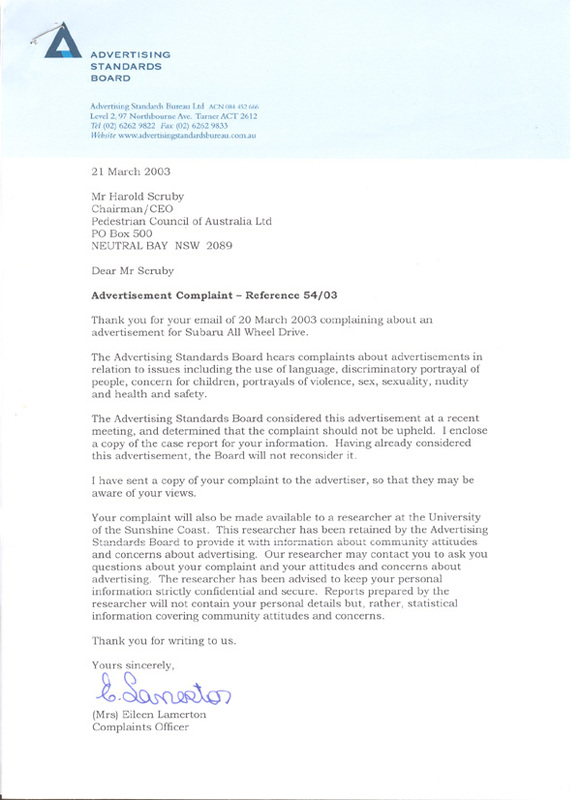 (a) Advertisement: means matter which is published or broadcast in all of Australia, or in a substantial section of Australia, for payment or other valuable consideration and which draws the attention of the public, or a segment of it, to a product, service, person, organisation or line of conduct in a manner calculated to promote or oppose directly or indirectly that product, service, person, organisation or line of conduct. (b) Motor vehicle: means passenger vehicle; motorcycle; light commercial vehicle and off-road vehicle. (c) Road: means an area that is open to or used by the public and is developed for, or has as one of its main uses, the driving or riding of motor vehicles. (d) Road-related area: means an area that divides a road; a footpath or nature strip adjacent to a road; an area that is not a road and is open to the public and designated for use by cyclists or animals; an area that is not a road and that is open to or used by the public for driving, riding or parking motor vehicles. 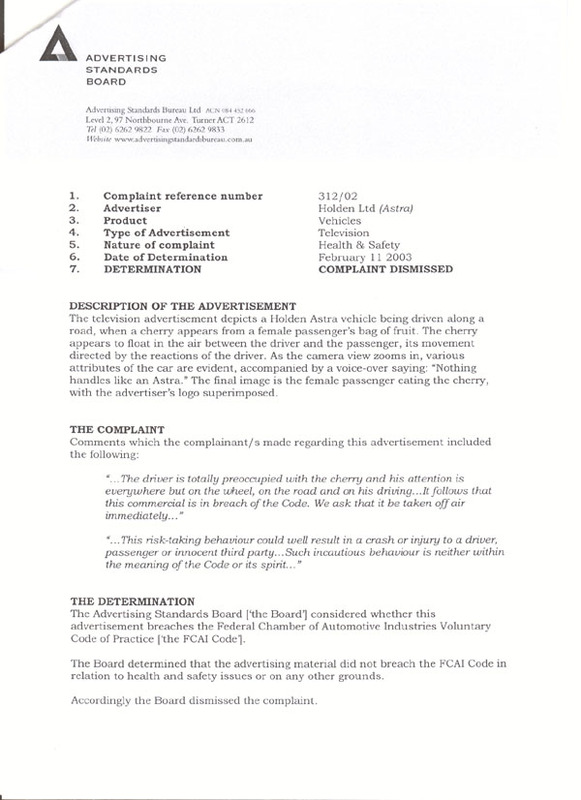 (a) Obviously unsafe driving, including reckless and menacing driving to the extent that such practices would breach any Commonwealth law or the law of any State or Territory in the relevant jurisdiction in which the advertisement is published or broadcast dealing with road safety or traffic regulation, were they to occur on a road or road-related area. 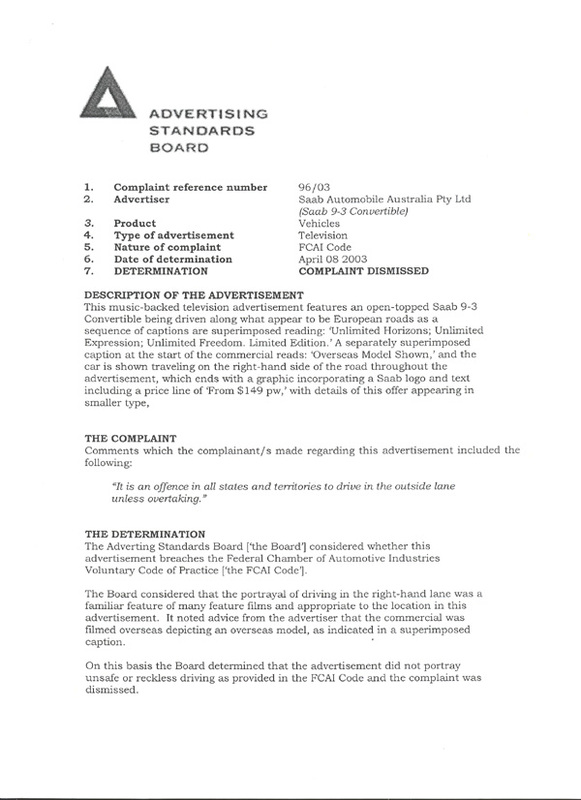 (b) People driving on a road or road-related area at speeds in excess of speed limits in the relevant jurisdiction in Australia in which the advertisement is published or broadcast. (c) Driving practices which clearly take place on a road or road-related area and which breach any Commonwealth law or the law of any State or Territory in the relevant jurisdiction in which the advertisement is published or broadcast directly dealing with road safety or traffic regulation. 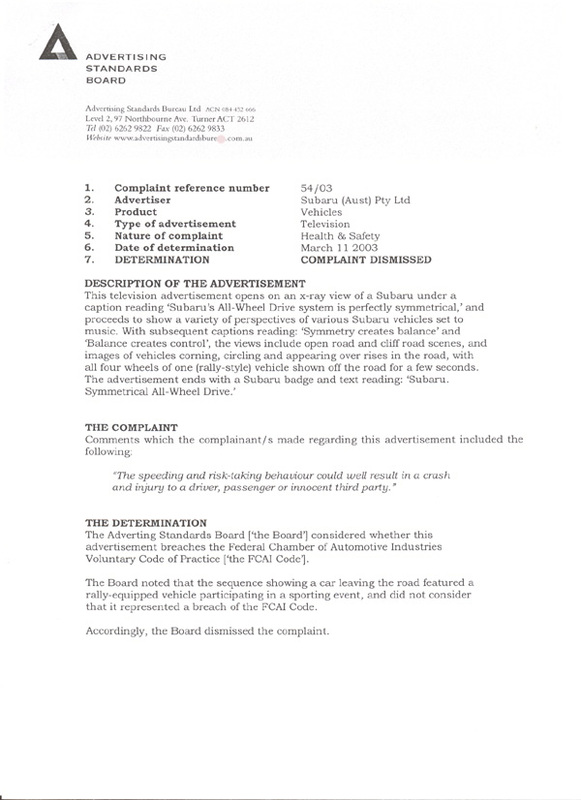 (d) People clearly driving under the influence of drugs or alcohol to the extent that such driving practices breach any Commonwealth law or the law of any State or Territory in the relevant jurisdiction in which the advertisement is published or broadcast dealing directly with road safety or traffic regulation. 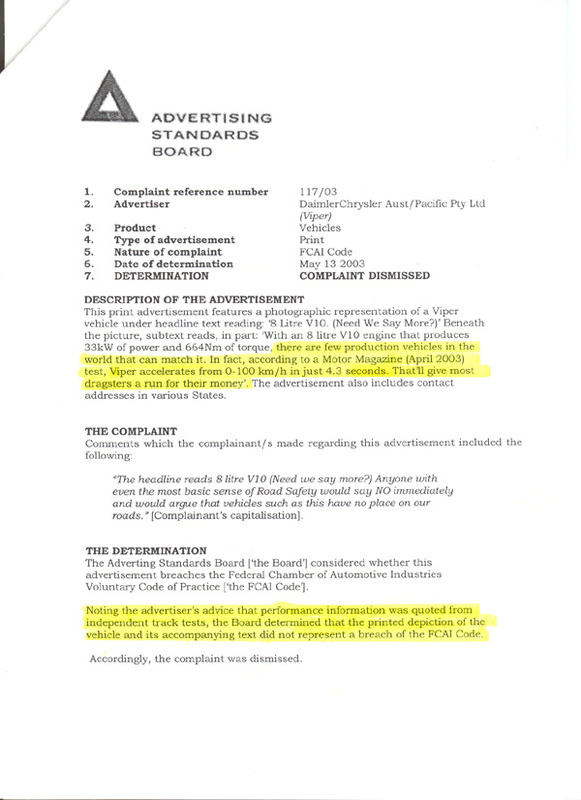 (e) Motorists driving while clearly fatigued to the extent that such driving practices breach any Commonwealth law or the law of any State or Territory in the relevant jurisdiction in which the advertisement is published or broadcast dealing directly with road safety or traffic regulation. (f) Motorcyclists or their passengers not wearing an approved safety helmet, while the motorcycle is in motion. 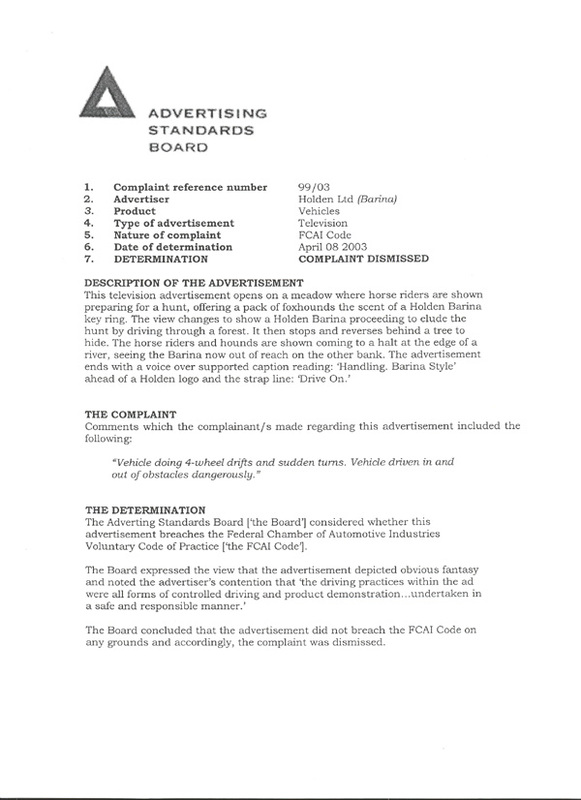 (g) Deliberate and significant environmental damage, particularly while advertising off-road motor vehicles. "0-100 km/h in j4.3 seconds. That'll give most dragsters a run for their money"